Find hotel near First Strudel House Of Pe .. 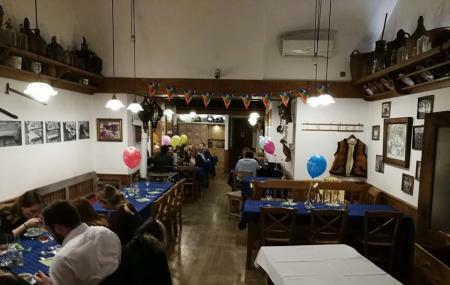 The 1812 Building of the Strudel House offers the visitors perfect gastronomic delight through their traditional strudels, cakes, Hungarian fish soup and goulash. The chefs of the restaurant are highly efficient in the traditional art of Strudel making using the finest ingredients and an original recipe. The cozy and traditional Hungarian Atmosphere of the place is perfect for a romantic date, a family dinner or a business meeting. They offer unique strudels with unique ingredients such as sour cherry, poppy seed, curd, plum, apple, Raspberry, cabbage, raisin, apricots and so on. Don’t forget to try the Ice cream, sponge cake, soufflé from desserts section. Lamb, fish, beef, veal, game birds and pork dishes are also fabulous. Bitter spirits, tequila, gin, vodka, cognac, brandy, rum, deluxe, Irish, scotch, bourbon, vermouth, cocktails, beers, soft drinks and juices are also available here. Make your visit suitable to your interest, use Budapest trip planner for personalization. Hotels like Hotel Charles, Burg Hotel and Hotel Orion VÃÃÃ‚ƒÂ¡rkert will solve your problem of where to stay in Budapest. Generate executable plans on your own or book the top rated Budapest vacation packages for your visit. Read more on how to reach Budapest. We haven't tried a Hungarian strudel and saw this place so we stopped in. It was early evening and we were seated right away. We ordered the apple strudel and it's big enough to share. We also had a hot chocolate. The strudel was tasty and the icecream was delicious too. The hot chocolate was rich and creamy. Service was pleasant and efficient. The tip is already included in the bill as a separate line item. Overall pleasant experience. We went here for only one reason - to have some poppy seed strudel, and the strudel was very good. Probably not the best I’ve ever had but an 8/10. 👌 You can also watch the staff making the strudels which is quite entertaining. The atmosphere and decor are nothing special, but the staff is friendly. Prices are ok too. First impressions during a walking tour, seemed okay, had a melange coffee with some strudel bites ...nice. Must say I like the melange variation with honey as the sweetener. Different from Vienna. Should we return for an evening meal my rating may change...as a start, adequate.. The food was pretty good, and the toilet was very nice and fancy! Check this place out if you need some good food and service. Disloyalty to the final account! Besides the strudels we also ask for an orange juice in this restaurant. When We finish the meal and the moment we request the payment, we notice that there is more charge of another orange juice and a strudel. When we questioned the waiter about the improper collection of the juice and the strudel, he told us that the value of the orange juice on the menu referred only to 100ml and that the cup would fit 200ml, for this reason we were charged double. We feel injured about it. It's disloyalty from the restaurant to have information like that on the menu. We'll Never get back to this place.